Stainless steel case with a stainless steel bracelet. Unidirectional rotating stainless steel bezel. Silver dial with silver-tone hands and stick hour markers. Arabic numeral marks the 12 o'clock position. Date display appears at the 6 o'clock position. Chronograph - three sub-dials displaying: 60 seconds, 30 minutes and 24 hours. Quartz movement. Scratch resistant mineral crystal. Textured stainless steel crown. Solid case back. Case diameter: 40 mm. Case thickness: 11 mm. Deployment clasp. Water resistant at 100 meters / 330 feet. 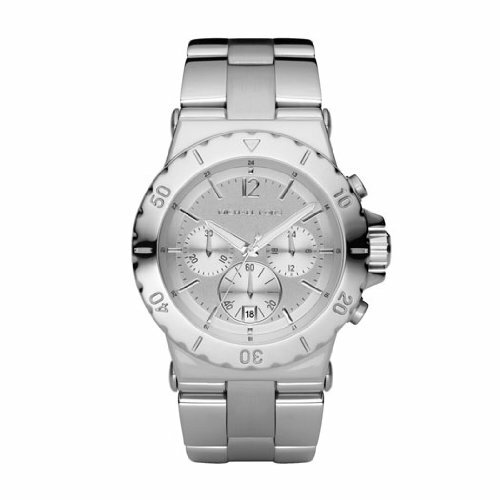 Michael Kors Chronograph Ladies Watch MK5312.